Denim is such a versatile and timeless clothing piece. People have been wearing denim since 90s and it seems like there is no looking back. 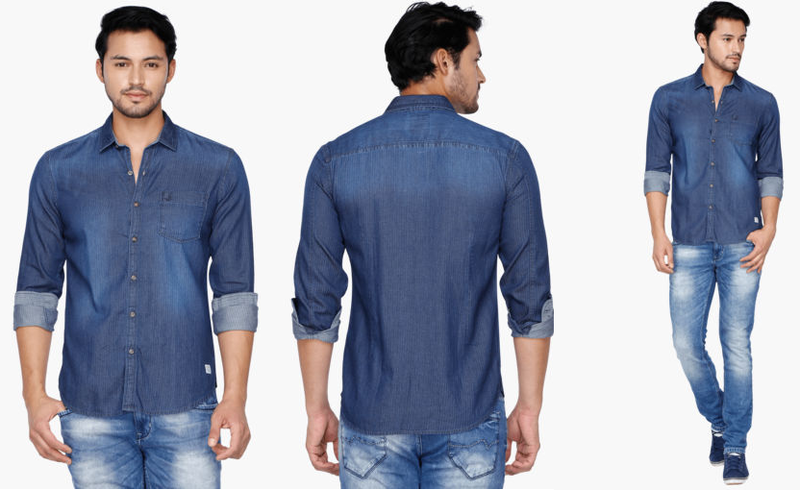 Denim is ruling the fashion charts like never before and we are sure it is going to stay for the time to come. Denim earlier originated as a men’s wear only. But later both the genders started wearing and loving it. Indubitably, denim is very close to guy’s heart. Not having a pile of denim in the wardrobe is surely going to raise eyeballs, right?This very easy going, no -fuss clothing is a darling for every guy. Last but not the least is our favorite – denim jeans. The first pair of bottoms anyone ever bought has been a pair of denim jeans. It is such a versatile and timeless clothing piece that you can’t survive without denim. We all know and have been going gaga over denim shirts. It’s a timeless piece in fashion circles. But earlier guys used to wear denim shirts only with jeans. But now you can wear denim shirts with a plain tee or may be printed tee inside. Also, wearing denim shirts with shorts on the beach is a good option. This is the newest addition to the guy’s wardrobe. 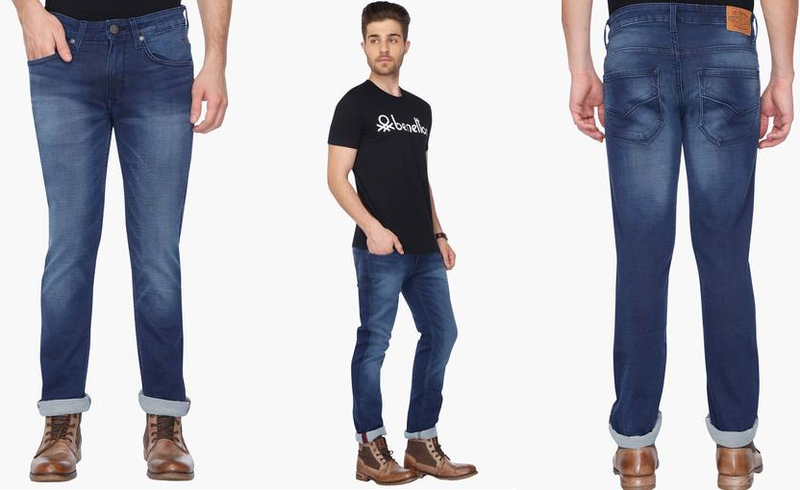 Denim tees are mostly round neck plain tees which can be worn with pants. They look extremely sporty and stylish. But be careful it is a 100% causal outfit so dare not wear it at any regular outings. Young boys or teenagers mostly wear denim watches. They look very stylish and peppy. 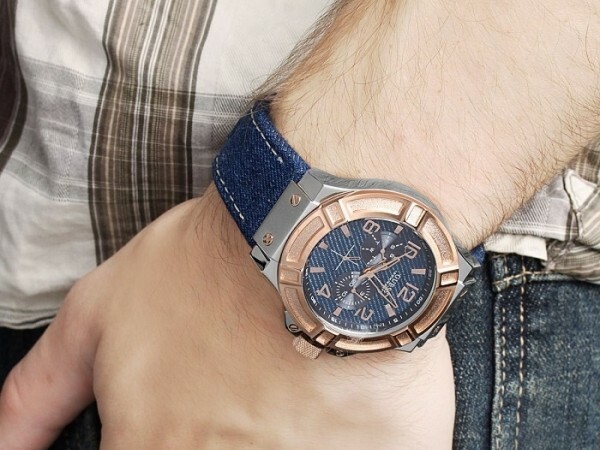 You can see a denim strap watch with some cartoon or funky dial at the center. It is a beautiful and fresh addition to your watch collection and can be part of a day outfit. Denim shoes are a very common type of shoes among men. They come under the category of casual shoes for men. Guys can pair denim shoes with plain or printed tees. You can also wear denim shoes with shirts too. Overall denim shoes impart a sports look, and it’s a must have in your shoe closet. Denim hats are another versatile piece of accessory is guy’s wardrobe. Imagine a guy wearing plain white or black polo tee and denim hat and sunglasses. It forms a perfect summer accessory for guys and looks extremely casual yet stylish. But make sure that you don’t end up wearing denim hats in the rain because they take too long to dry. A very common accessory piece among guys. You can wear denim belts just like any other belt. But dressed in a denim belt with a plain shirt or tee just amps up the entire look and you will end up making a fashion statement by the end of the day. So, these were the seven must have denim piece for men’s wardrobe. If your favorite material is denim, then you ought to own these pieces in your wardrobe. All of these denim pieces are readily available and extremely affordable. You don’t need to spend extra bucks or look for some designer labels to buy them.